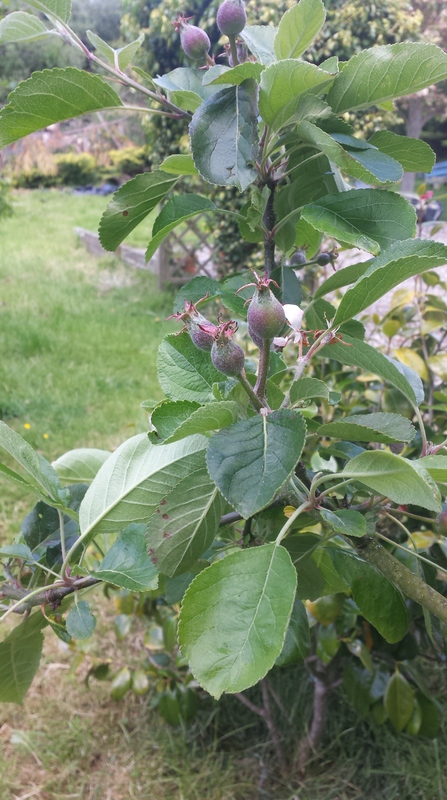 To me nothing signifies summer so much as our little apple buds beginning to swell. Summer has finally arrived, late and half-hearted as it often tends to be in this corner of the world. Like any red-blooded male I rushed to the supermarket at the first glimpse of a clear sky yesterday and bought up most of their stock of charcoal, as well as enough meat to feed a small army, which was supposed to last us the whole weekend. In my enthusiasm to get grilling last night I somehow managed to cook all the sausages, chicken legs and homemade burgers at one sitting (standing?). What’s more, the rest of the family also seemed to get caught up in Barbecue Fever and, indulging their inner carnivores, managed to scoff more or less the entire mountain of meat. Feeling a little the worse for wear after last night’s meat binge (which I admit may have been washed down by an ale or two), I figured we needed to have a vegetarian day, and these protein-rich chickpea burgers with their soft sourdough buns always go down a treat. They’re also really easy to prepare. I like to serve them with a good dollop of sweet chilli sauce, but they’d be equally good with some mayonnaise. Our raised vegetable beds are just beginning to produce some lovely salad leaves as well, which make for a beautiful light side dish. Around 9 hours before you plan to eat, combine all your ingredients and knead thoroughly by hand or (preferably) with a mixer and dough hook until you have a very smooth, soft dough. Allow to rest for 30 minutes. Turn the dough out onto a lightly floured surface and stretch and fold it, forming it into a ball with a smooth surface. Place smooth side up in a clean lightly oiled bowl and cover. Allow to ferment for around 6 hours at room temperature. 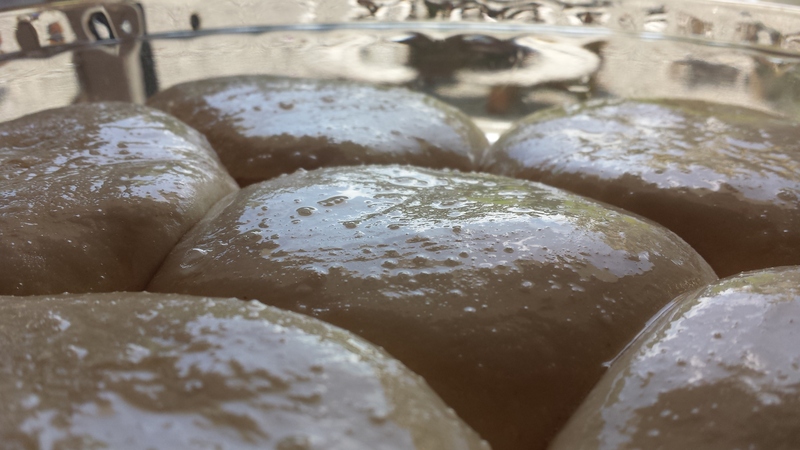 Again, turn out onto a floured surface and divide and shape into 6 small balls of dough. Using the palm of your hand pat each of these down until they are no more than 1cm thick, then place in a greased baking dish and cover for their final proof. After around an hour, brush the tops of the buns with an egg white and place in a preheated oven at 190C (375F) for 20 minutes. Remove from the baking dish and allow to cool on a wire rack for about an hour before serving. Sourdough buns all set for the oven. 80g breadcrumbs- sourdough of course! Preheat your oven to 220C (430F). Using a blender, puree half the chickpeas with the rest of the ingredients except the tomato. Place the puree in a bowl and mix in the remainder of the chickpeas and the tomato, keeping them intact. Using your hands, form the mixture into 6 patties (squeeze them tight! ), and place them on a well-oiled baking sheet. Bake the burgers for 15 minutes, turning them over after 10 minutes. Serve in your sliced cooled buns with the topping of your choice and enjoy the taste of summer. 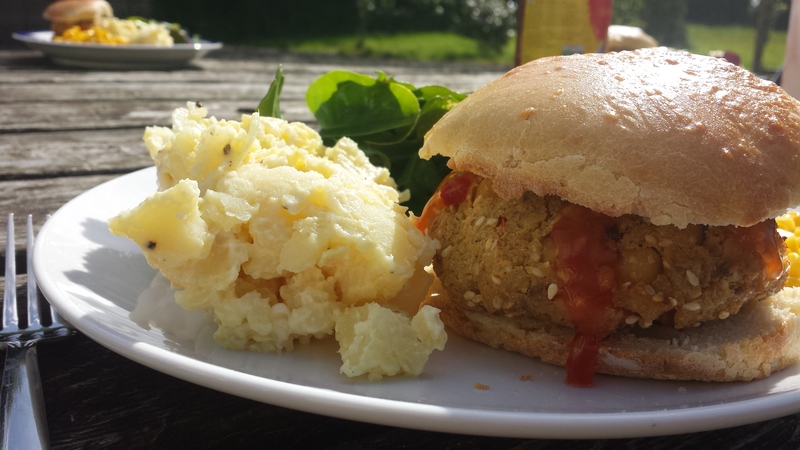 Delicious healthy vegetarian burgers, served with fresh sourdough buns, potato salad, and homegrown greens. Thank you very much Lisa, that’s very kind of you!